Based upon a story by Edna L. Lee and Harry Lee, All That Heaven Allows is arguably Douglas Sirk’s greatest romantic drama, bringing together again Jane Wyman and Rock Hudson, who had made Magnificent Obsession with Sirk the year before. Cary Scott (Wyman) is a well to do widow with two grown children who is living an empty and lonely life ever since her husband’s death. Her upper class friends try to hook her up with an elderly friend of the family and even try to get her a television set, which they believe is the perfect companion for a woman alone at house. Cary however falls for her handsome gardener, Ron Kirby (Rock Hudson), who is twenty years her junior and lives a lifestyle much less restrained that that of her small-minded social circle, where conformity and financial security are the highest honored values. Whilst she is initially hesitant, Cary agrees to marry Ron as the two love each other deeply but dealing with the social repercussions might be too much for her to handle. A scathing attack on social conformity and small mindedness from the 1950s, All That Heaven Allows was panned by critics at the time but like most of Sirk’s work has gained tremendous stature over the years. The soapy melodrama is given a highly stylized and visually ironic look and both Wyman and Hudson, as well as the supporting cast, put in great performances. A stunning looking film with sumptuous Technicolor photography and great use of architectural mise-en-scène, All That Heaven Allows is simply stunning. Special mention should also go to the deer, which put the finishing touch on the syrupy sweet imagery. 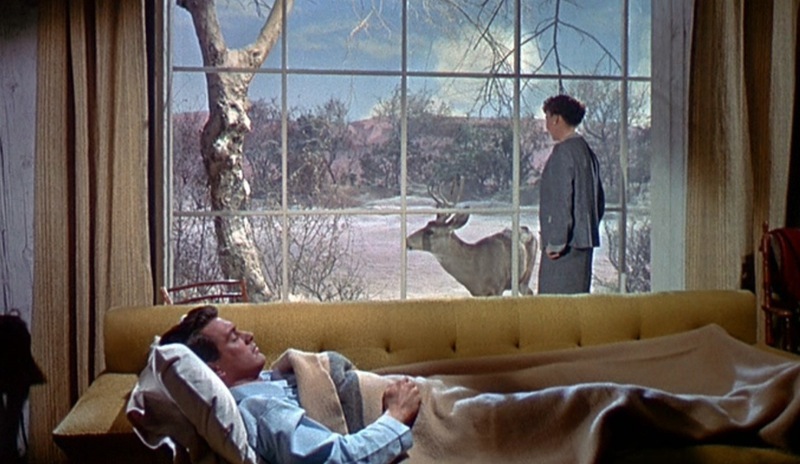 Other noteworthy films by Douglas Sirk in Technicolor: Magnificent Obsession and Written on the Wind. Based on the novel of the same name by Jack Trevor Story, The Trouble With Harry is a 1955 morbid yet romantic black comedy by Alfred Hitchcock, starring Edmund Gwenn, John Forsythe and Shirley MacLaine in her feature film debut. The Trouble With Harry becomes apparent very early in the film: Harry is dead. It’s autumn and in a little village in Vermont little Arnie (Jerry Mathers) stumbles across a corpse in the countryside. He goes straight home to tell his mother Jennifer (MacLaine), who soon discovers that the body belongs to her ex-husband. As she earlier hit him over the head with a milk bottle, she assumes this was the cause of his death. Meanwhile, retired Captain Albert Wiles (Gwenn) also finds the body and thinks he might be the one responsible for Harry’s death due to a stray shot he let off whilst he was hunting. Then there’s Miss Gravely (Mildred Natwick), who also thinks she might be at fault as she also hit Harry over the head after he stumbled out of the bushes, still recovering from his earlier hit with a milk bottle by his ex-wife. And whilst slowly but surely the entire town seems to get involved in the mystery of Harry’s death and what to do with his corpse, an out of town artist (Forsythe) starts looking into the matter, amazed at the indifferent attitude of the town folk, who seem primarily concerned about not getting the authorities involved. The only pretty much straight up comedy in Hitchcock’s lengthy filmography, The Trouble With Harry might not be one of the master’s greatest films but apparently it was his own personal favourite. But besides the rare comedic tone and Hitchcock’s preference for this film, the movie particularly stands out because of its amazing Technicolor cinematography, which truly makes the Vermont autumn look incredible. Add to that a light and idyllic score by Bernard Hermann and a great debut by Shirley Maclaine, who was a welcome change from Hitchcock’s regular platinum blonde protagonists, and you have a rather unique work within the director’s oeuvre. The Trouble With Harry was nominated for two BAFTA Awards for Best Film and Best Actress. Other noteworthy feature animated films by Alfred Hitchcock in Technicolor: To Catch a Thief, Vertigo and Marnie. A classic fantasy featurette, The Red Balloon is a virtually dialogue-free short directed by Albert Lamorisse and starring his son Pascal Lamorisse. Walking to school one morning, a little boy comes across a big bright red helium-filled balloon. As he walks around and plays with it, the boy realizes that the balloon seems to be sentient as it follows him and listens to his command. The boy takes the balloon everywhere he goes and the two become inseparable. But when a bunch of bullies manage to steal his new found friend and use it for target practice with their slingshots, it looks like the boy might be left all alone again. 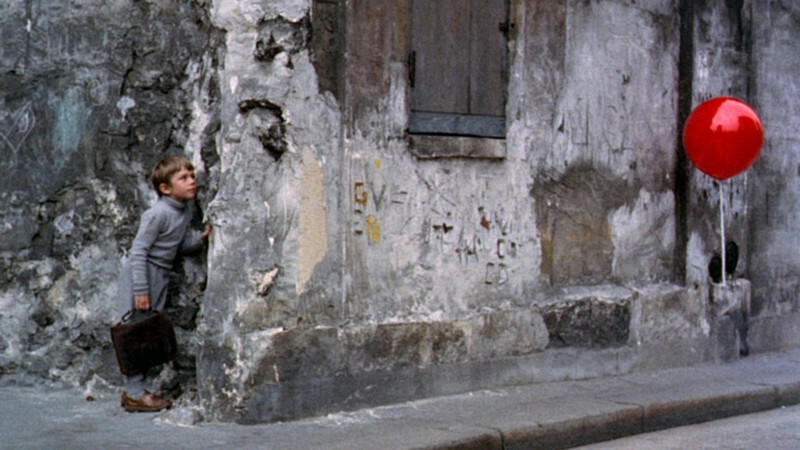 The Red Balloon is a stunning looking short, shot in vibrant Technicolor in the Belleville district of Paris, which had fallen into decay and has since been completely demolished and rebuild. Extremely poetic and lyrical, the film is an ode to the magic of one’s childhood and a tale about friendship and loss. Not only a great short family film but also a wonderful record of a part of Paris which no longer exists, shot in rare and stunning color. The only short to ever win an Academy Award for Best Original Screenplay, the film won various prizes worldwide, including the Palme d’Or for short films and a special award at the BAFTA Awards. 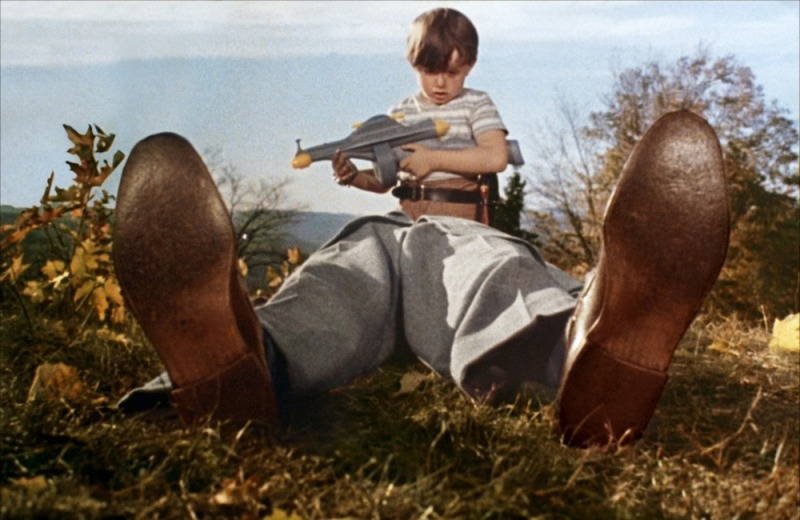 Based on a The New Yorker article called Ten Feet Tall by medical writer Berton Roueché, Bigger Than Life is a drama directed by Nicholas Ray and starring James Mason, who also co-wrote and produced the film. Ed Avery (Mason) is an elementary school teacher, who is moonlighting at a taxi cab company to make ends meet for his family. Recently, he has been having painful physical spasms and blackouts and when he is finally taken into hospital, he is diagnosed with an arterial disease, which gives him no more than one year to live. But there’s good news too: doctors are testing a new experimental drug, which might keep his condition under control. Soon, Avery is taking cortisone and is feeling better than he ever did. But when he starts abusing the drug and far exceeding the prescribed quantities, he starts suffering from extreme mood swings and turns into a psychotic megalomaniac, terrifying all around him, especially his wife Lou (Barbara Rush) and their son Richie (Christopher Olsen). Whilst Bigger Than Life was actually shot in DeLuxe Color, the film is listed as a Technicolor feature in the Criterion Collection as it was processed using the Technicolor No. V process, which is all the excuse I need to include it in this list. 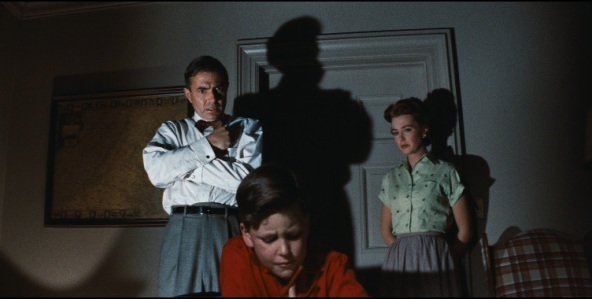 Dealing with the problems under the surface of the “normal” American family life of the fifties, Bigger Than Life would make a great double feature with the aforementioned All That Heaven Allows by Douglas Sirk. Mason’s transformation might be a bit sudden but his performance is fantastic as he turns from a gentle and loving family man and teacher into a crazed mad man. The film was very controversial in its time and didn’t do well but was praised by the critics of the influential French Cahiers du cinéma. Bigger Than Life received a nomination for the Golden Lion at the Venice Film Festival. 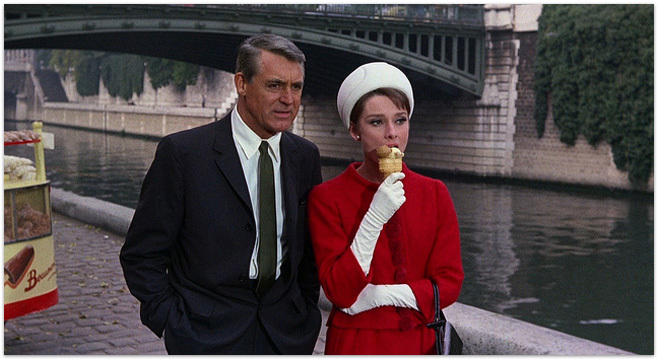 The second collaboration of director Stanley Donen and Audrey Hepburn (after they previously collaborated on Funny Face), Charade is maybe easiest described as the best Alfred Hirchcock film ever made, not actually made by Alfred Hitchcock. And just like Hitchcock’s North By Northwest, the leading man here is Cary Grant. Reggie Lampert (Hepburn) has decided to divorce her husband, but upon her return to Paris from holidays she finds out that he has in fact been killed. She meets Peter Joshua (Grant), seemingly a stranger, who offers to help her out when it becomes apparent that her late husband and four accomplices stole $250,000 dollars meant for the French Resistance during the war. Her husband took off with the loot and three of the men (the fourth one having been killed in the war) are now after her and the money they feel they are still entitled to. The problem is that Reggie never knew about the crime and doesn’t know what happened to the money. And matters complicate further when the three accomplices start turning up dead themselves and her new found friend turns out to not be the person he had claimed to be. Charade is part comedy, part mystery and part romance. Benefiting from a great screenplay, the chemistry between its two leads, who are also nicely supported by a cast which includes Walter Matthau, James Coburn, George Kennedy and Jacques Marin, an award winning soundtrack by Henry Mancini, nice location shooting in Paris and of course sumptuous Technicolor photography, Charade is a classic thriller with clear screwball comedy influences. Hepburn also won a BAFTA award for her performance here. One of the most beautiful period pieces ever put to celluloid, Luchino Visconti’s The Leopard is a work of stunning beauty. As if its locations, art direction, production &costume design and beautiful landscapes weren’t stunning enough of and by themselves, they are enhanced tremendously by Visconti’s use of lush Technicolor. Based on the novel by Giuseppe Tomasi di Lampedusa, The Leopard tells the tale of the Prince of Salina (Burt Lancaster), a noble aristocrat of impeccable integrity, who tries to preserve his family and class amid the tumultuous social upheavals of 1860’s Sicily after Garibaldi’s forces have embarked in Sicily. Salina foresees the fall of the aristocracy but his nephew Tancredi (Alain Delon) sees new opportunities and joins Garibaldi’s army and also starts courting Angelica (Claudia Cardinale), the daughter of the town’s newly appointed Mayor, Don Calogero Sedara, who represents the new upcoming bourgeoisie. Filmed in glorious Techniscope and rich in period detail, the film is a remarkable cinematic achievement in all departments and the last act of the movie, an almost hour-long ball, is often cited as one of the most spectacular sequences in film history. Also noteworthy is the film’s cast, with Burt Lancaster arguably giving the greatest performance of his career here, whilst Alain Delon and Claudia Cardinale also shine. The film won the Palme d’Or at Cannes in 1963 and also received an Academy Award nomination for Best Costume Design the following year. One of the most opulent films ever made, The Leopard is a true Technicolor masterpiece. Other noteworthy feature animated films by Luchino Visconti in Technicolor: Senso, Death in Venice and Ludwig.